Not everyone is fond of snakes. In fact, if we had to compile a list of animals which badly need a public relations make-over, snakes would probably be firmly in the number one spot. It is probably no coincidence that if we had to rank animals according to the number of myths, tall stories and outright lies told about them snakes would be at the top of that list too. Even supposedly scientific accounts are often very subjective: for instance, the generally accepted scale of potency of snake venom is the WHO-approved LD50, based on the amount of venom required to kill mice. The top seven snakes on this are from Australia, with the Inland Taipan at number one, and on this basis it is frequently claimed to be the world's most dangerous snake, yet there is no documented case of a human dying from an Inland Taipan bite, and Brian Bush, a noted Australian snake expert, points out that the effect of venom on mice is not always the same as that on humans. The snake responsible for most human deaths is probably the Saw-scaled Viper, which occurs from West Africa to South Asia, and doesn't even feature on the LD50 list. Our undisputed local champion when it comes to tall stories is the Black Mamba (Dendroaspis polylepsis); like most South Africans I was brought up on stories of mambas chasing people, of mambas which reared up higher than a man's head, and of people dying in ten minutes after being bitten. Terror is a potent magnifying glass. 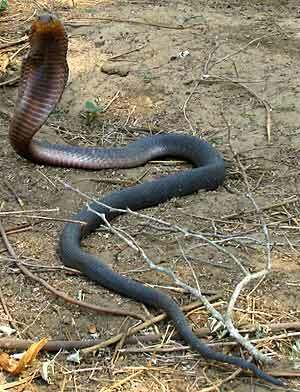 The black mamba is certainly a contender for the title of Africa's most dangerous snake: it's big (routinely 2-3 m or 6-10 ft long, reaching 4 m/12 ft or more) and fairly fast-moving, it will bite readily if cornered or harassed and it has a potent neurotoxic venom. However, they can only raise about one third of their body length off the ground (do the maths) and I have never met any snake which was aggressive in the sense of advancing to attack, although I have had snakes come toward and past me to get to a hole. 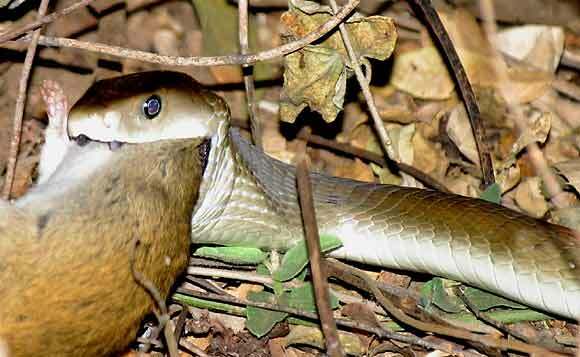 Earlier this year I came across a huge Snouted Cobra (Naja annulifera). When I approached it first tried to burrow into the ground, and when this was too hard it moved away; it was only when I actually tickled its tail that it stood up to be photographed (right). The ultimate snake story comes from Garth Thompson, author of The Guide's Guide to Guiding, who found himself confronted by a large Black Mamba inside a hollow baobab tree. The only way out was a crevice at chest height, and the mamba was reared up within striking distance of it. The snake attempted to get away through a small hole at ground level, but seeing other people outside it came straight back in again. Eventually Garth was passed a pole from outside which he used to climb to the hole, and as his arms appeared through it his friends whipped him out like a champagne cork. The point of both these stories is that despite the proximity the snakes were not aggressive. An analysis of the 40 snake-bite deaths in Australia over 27 years (0.13 per million people per year, you Aussie story-tellers) shows that about half resulted from people stepping on snakes, frequently bare-footed, drunk, or both. Another third were people who were handling or trying to kill snakes. Less than 10% were considered accidents "unavoidable with normal awareness". The causes of snake-bite in Southern Africa would be proportionally very similar, so the moral is very simple: leave them alone and they'll leave you alone. Most dangerous snake bites here result from people stepping on Puff Adders (Bitis arietans) which rely on stillness and camouflage for defence. The absolute first priority with any snake bite is to get the victim to a hospital as fast as possible; if you get there alive the odds are you'll stay that way. Of course if you do get bitten by a black mamba and if you receive a full dose of venom you may have a problem. In extreme cases death can result in an hour from respiratory or cardiac arrest, but if you can keep the pulse and breathing going until you get to hospital you should make it. Anti-venom should generally only be administered at a hospital; many people have a serious reaction to the serum and unless you have the facilities to deal with anaphylactic shock it may be more dangerous than the snake-bite. To put this all in perspective however, statistically you have less chance of dying from snake-bite in Southern Africa than from being struck by lightning.